Sorry about the big lay off guys. I had a lot going on and I preparing to put together a show in January. More details to come. 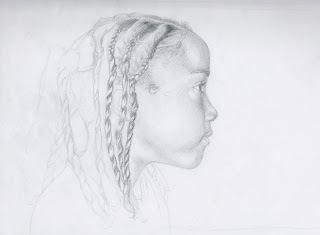 This is a drawing of my niece who just got here hair braided by her mom. This piece is outstanding. I've always thought your ability to work with acrylic was superb but I didn't know you could pencil just as well. Are you gonna leave the left portion of the picture as it is in this photo? I kind of like it that way. Some artists do that, some don't. Anyway, it's great as it is. Thanks at first I had every intention of "finishing" the drawing but i think it looks fine the way it is.